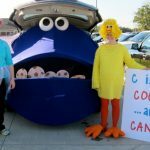 Coffee Filter Crafts - C.R.A.F.T. 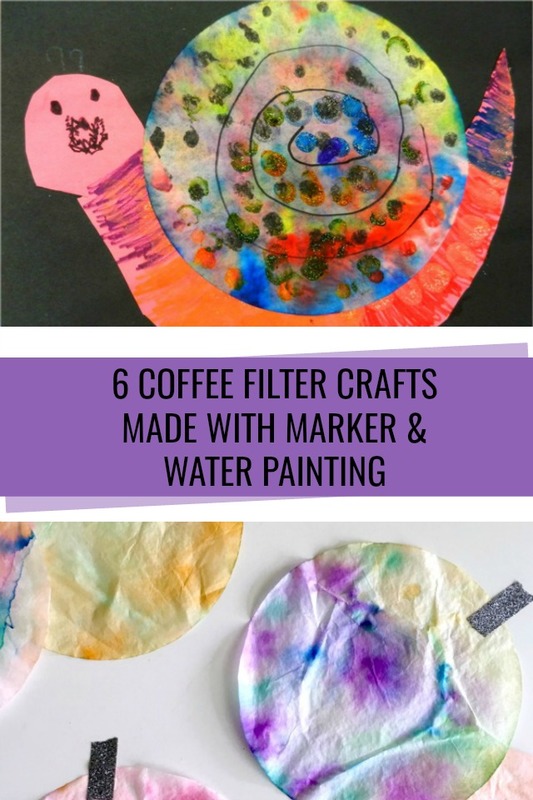 Marker painted coffee filter crafts are one of my go to activities with my kids! It’s the perfect activity for the 30 minutes it takes me to throw dinner together in the late afternoon. Coffee filter painting keeps the kids busy and my 2 year old can do it by herself without much mess. The process is fun and painting the colors together with water keeps kids interested in making more. I also love that there are so many things to make with the tie dye coffee filters once they dry. You can craft everything from butterflies to snails and even party decorations! The best part? You likely have most of the materials on hand! I don’t drink drip coffee, so I bought a mega pack of coffee filters for crafting purposes. It’s absolutely the cheapest art canvas you will ever find! Here’s what you need to make tie dye coffee filters. Coffee filters – Grab a pack of 100 coffee filters at the Dollar Store. Set out a few coffee filters and let the kids color all over them with marker. Make designs, scribbles, pictures, it doesn’t matter. Fill a plastic cup with an inch or so of water. Make sure the coffee filters are on top of a tray or baking sheet so the colored water as somewhere to collect. 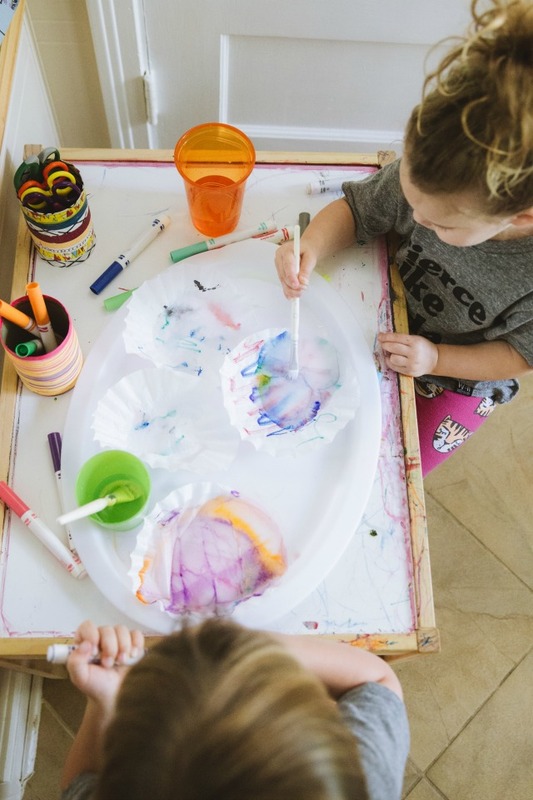 Then, show the kids how to dip the paint brush into the cup of water and paint the marker on the coffee filter. My kids typically make 4-6 coffee filters in one setting. This doesn’t take as long as you might think. To speed up the drying process set them outside in the sun. 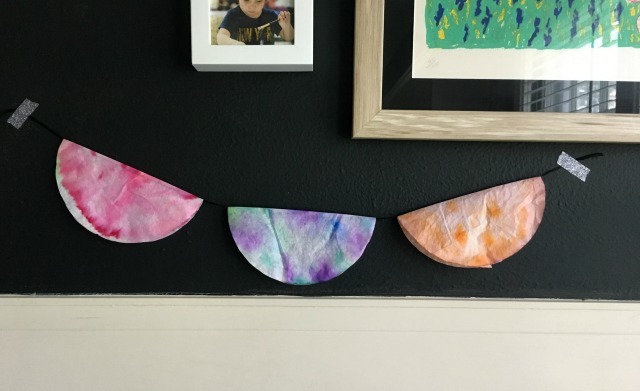 My kids typically end the craft process here with tie dye coffee filters. We usually hang themas is on the kitchen windows. Some times I draw shapes on the coffee filters and let my son cut them out. 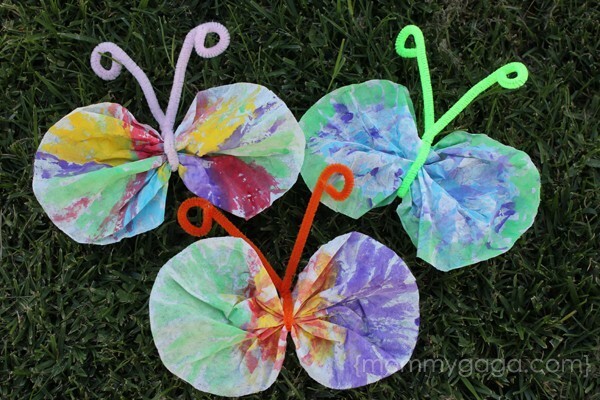 But, there are tons of fun crafts to make with the dries tie dyed coffee filters. 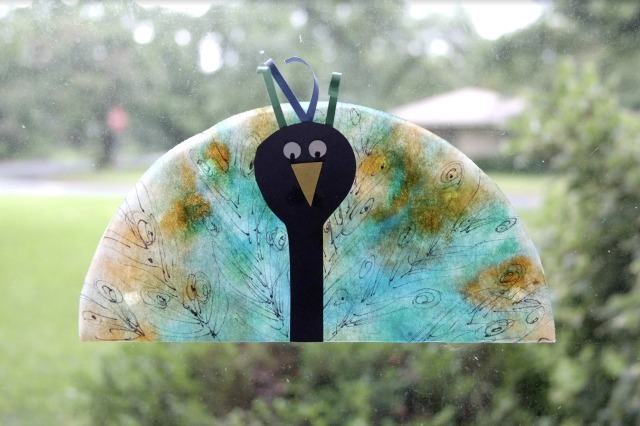 This cute peacock craft is from my book, Creating Really Awesome Free Things: 100 Seriously Fun, Super Easy Projects for Kids. 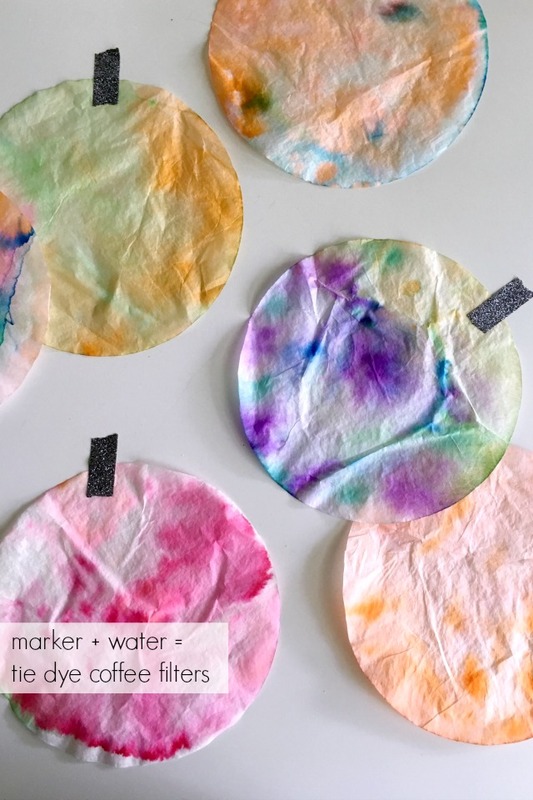 Simply make a tie dye coffee filter with blue and green markers. Then, cut a spoon shape out of black construction paper and glue it the peacocks body. 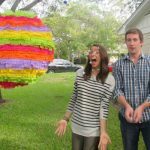 Add a face with different colored construction paper. Use a black pen to add feather markings directly to the coffee filter. 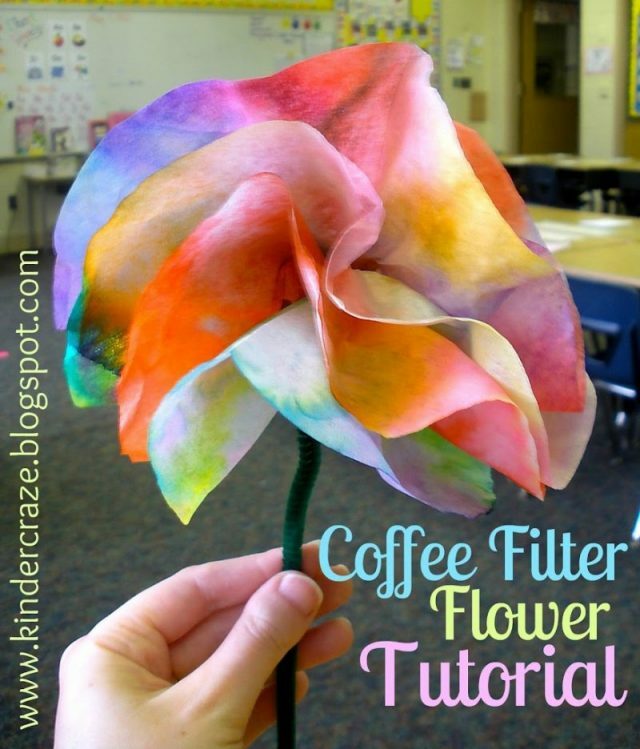 Make as many tie dye coffee filters as you’d like then, fold them over a string and tape them together! Hang up your coffee filter bunting and admire! Use the tie dye coffee filter technique, let it dry and the scrunch in half and add a pipe cleaner for antenna! 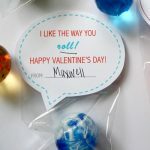 See the complete tutorial at Honey and Lime Co.
Use the marker water painting technique on the coffee filters and then add a construction paper umbrella handle. Easy peasy. To make a complete window scene on your window, use the tie dye coffee filter tutorial with shades of blue marker. Then, cut raindrop shapes out of the coffee filters. See the complete coffee filter umbrella tutorial at Sunny with a Chance of Sprinkles. 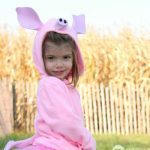 Just add a snail body and some glitter! 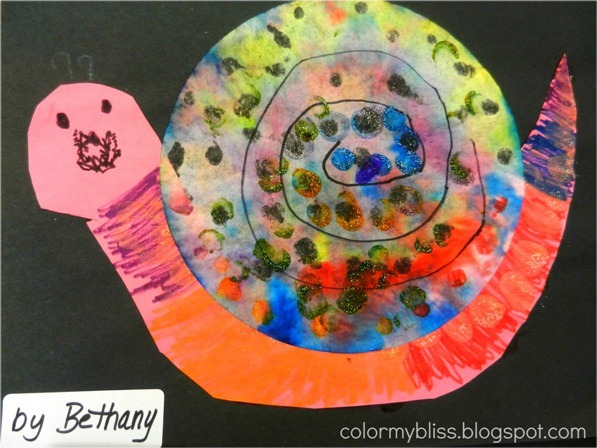 See the detailed tutorial and more adorable coffee filter snails at Color My Bliss. My friend, Maria, makes these adorable coffee filter flowers with her kindergartners to give to their mom’s for Mother’s Day! What a great idea. For the detailed tutorial, check out Kinder Craze. Which one do you like best? What other crafts have you made out of coffee filters? I’d love to hear! What perfect timing! 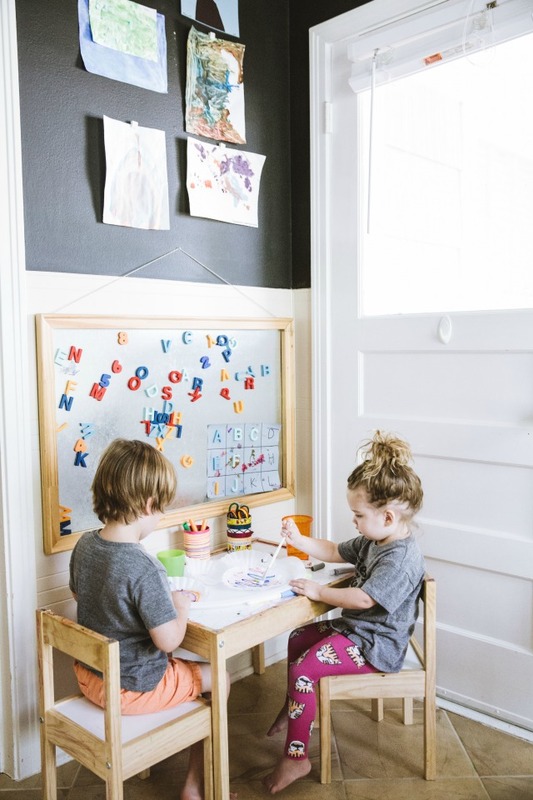 I will be watching 2 of my neighbor boys this summer while their parents work, so I need some fun crafty ideas to keep them busy and inside on hot days. All of the variations will give us plenty of ideas! Thank you!